I didn’t always enjoy cooking. In fact, cooking used to be a source of stress and anxiety, but it’s become a coping mechanism. My husband loves to cook and I began as a reluctant assistant in the kitchen. He made it fun and taught me things like how to time and pace yourself so all the food is ready around the same time, which eased the stressful parts. 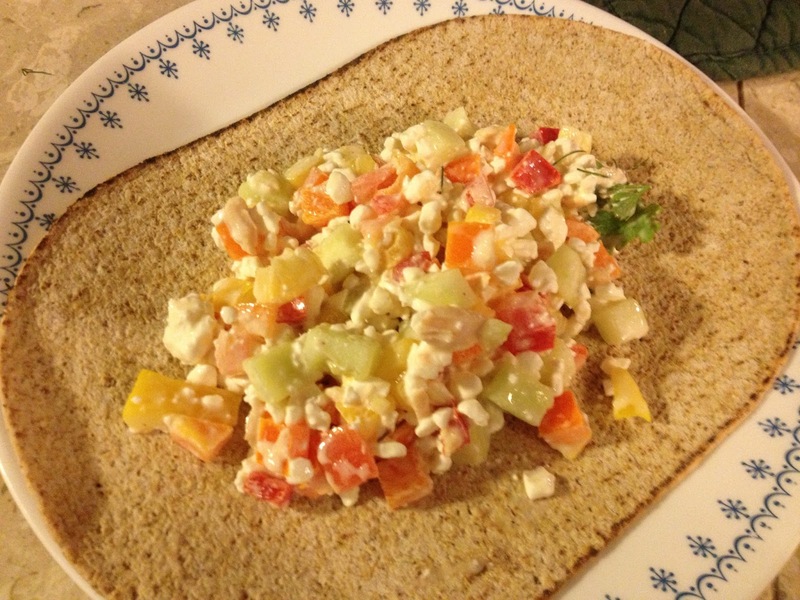 I first wrote a food post back in 2009, scrambled eggs and leeks, from a recipe book I still use and love, Energy Food: Energy-Giving Food Solutions to Keep You Fully Charged Throughout the Day, by Beverly le Blanc. Two other huge reasons I began to cook more were gardening and the Internet. My husband is also an avid gardener, and in the summer of 2012 we grew a garden overrun with yellow nutsedge (long story), but the garden produced the most yield we’d ever seen. We’d pick whatever was available in the garden that day, whether it be eggplant, tomato, zucchini or squash, and we’d Google ingredients, pick a recipe and make it, usually with modifications. We cooked a few food bombs but for the most part, ate healthy, delicious, pesticide and GMO-free food. I’m pretty sure that’s the healthiest eating I’ve ever done in a single summer. I lost 10 pounds and felt more energetic. My digestive system ran like a well-oiled machine. 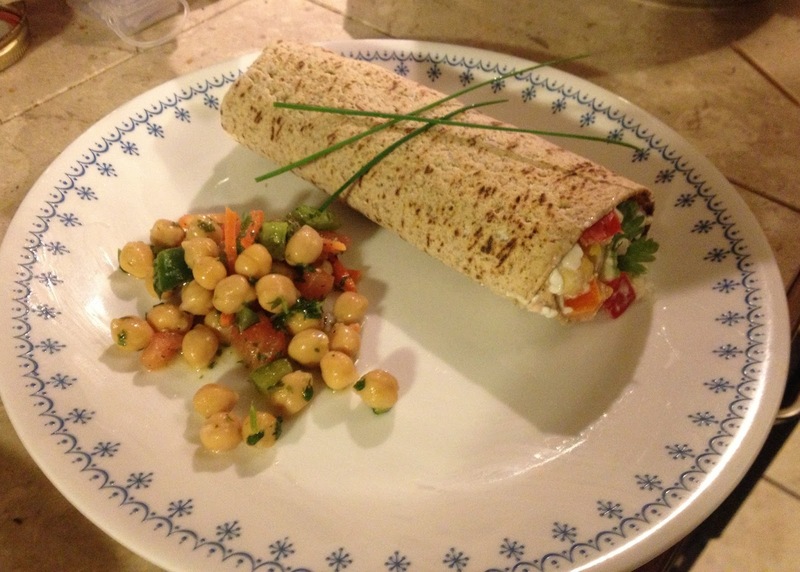 Along with the health benefits, I started to appreciate and enjoy the art of cooking. I love to chop vegetables (I’m a lot better at using a knife that I used to be, I had/have an irrational fear of knives, another source of anxiety), I love to saute and I love to follow and modify recipes. I used to get anxious if I didn’t measure out ingredients exactly, now I estimate and throw stuff in and add a little of this or that just for fun. In 2012 I made the transformation from horrible, awkward cook to a point where I now feel comfortable referring to myself as a foodie. Not only did I cook from our garden in 2012, I read two food memoirs that inspired me to want to write about food and cooking. 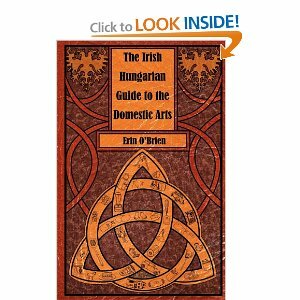 The Irish-Hungarian Guide to the Domestic Arts, by Erin O’Brien, is a laugh-out-loud funny read that weaves recipes and life into a literary tapestry that will make you ponder long after you’ve stopped giggling. I read this book in February 2012. 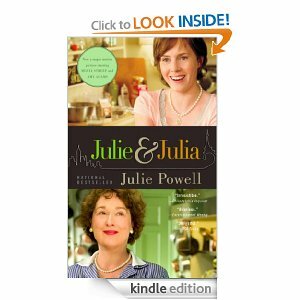 In September 2012, my friend Jonathan loaned me Julie Powell‘s Julie & Julia: My Year of Cooking Dangerously, a national bestseller and a movie starring Meryl Streep and Amy Adams (every author’s dream, a bestselling book made into a movie). It’s the story of how Julie Powell, almost 30 years old and unhappy in her clerical government job, cooked all 524 recipes from Julia Child’s Mastering the Art of French Cooking in a year, and blogged about the experience in order to reclaim her life. Not only did she reclaim her life, she ended up with a book deal. Jonathan has given me his blessing to keep the book, and I’m so grateful because it’s such an inspiration to me. In December 2012 I found out I was pregnant with our first child, and after three months of morning sickness my appetite kicked into high gear and I began cooking almost daily, without a vegetable and herb garden (going to the grocery store works just as well). I cooked through the whole spring and now that it’s summer, hit up the Howe Meadow Farmer’s Market on a rather regular basis and have cooked a few dishes with fresh herbs from our new raised bed herb garden. The vegetables are freshly planted, and while I’m no Julia Child, Julie Powell or Erin O’Brien, I figured it’s high time I write some foodie posts on this blog. While they’re in season, I plan to post recipes that feature herbs from our herb garden. If you try any of these receipes please free to modify them however it suits your needs, and I hope you’ll share what you did in the comments section. The first recipe comes from my mom, who made this for our family on 90 degree summer days in our non-air conditioned house when she didn’t want to use the stove or the oven in the heat and humidity. It’s light, refreshing, hydrating and filling. 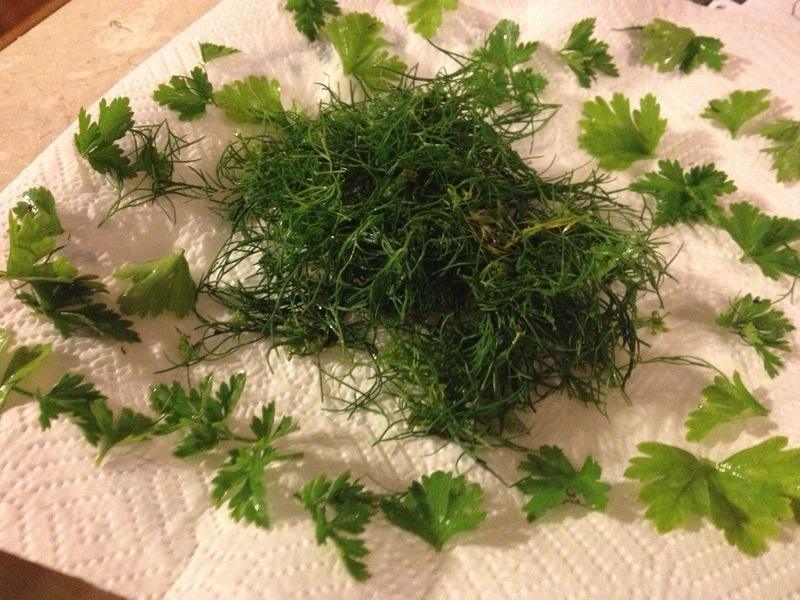 Today’s featured herbs are flat leaf parsley and dill. 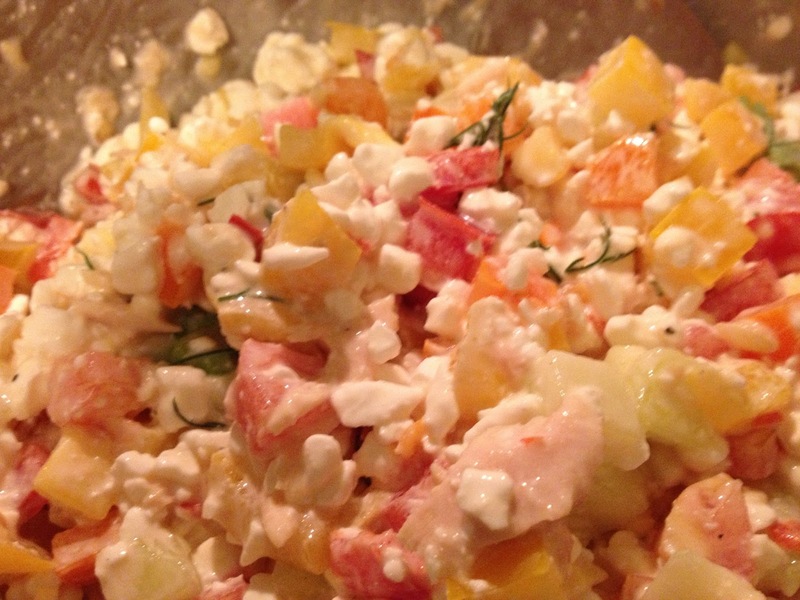 Combine cucumber, red pepper, orange pepper, yellow pepper, tomato, tuna and cottage cheese together in a large bowl. Stir until well mixed. Season with pepper, dill and parsley to taste. 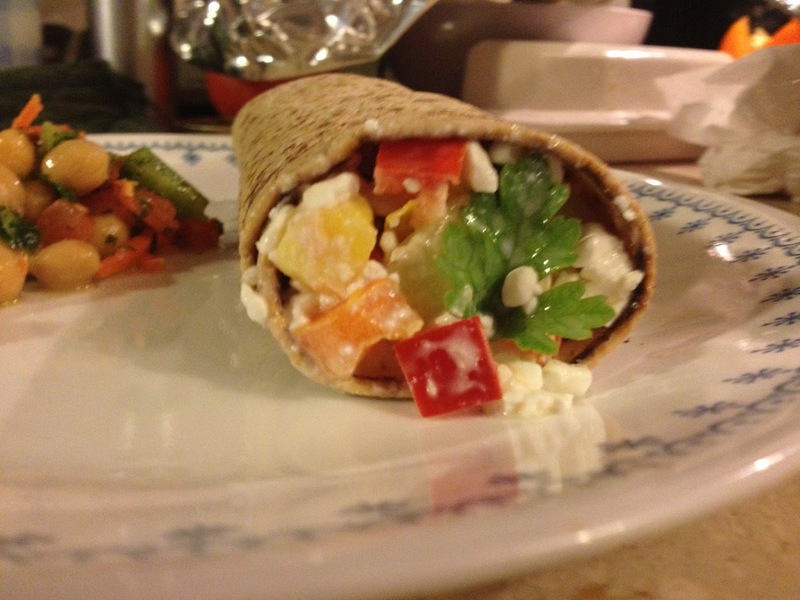 Scoop mixture onto flat bread or into pita pockets and serve. Roll it up and eat it! Cover bowl and refrigerate leftovers. Can also prepare in advance and chill in fridge before serving.